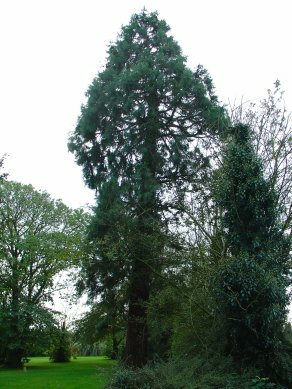 Near the entrance to the grounds of Peverells in Down Hall Road, stands a young Giant Redwood. The owners of this property had to work hard to clear the area of brambles and brush at chest height, and have laid the area to lawn. It was good to see that they had also taken steps to remove the ivy that so often spoils an otherwise good tree. Thanks to Peter, the owner of Peverells, for supplying the following history of the house and tree: "Peverells was constructed in 1936 by the Reverend Peverel, who built and owned a lot of properties in Bradwell and retired to the house. It was at this time I believe that the tree would have been planted making it 70yrs old. It was commandeered by the RAF as an officers house (not sure if the reverend was dead at this time) during the war, as was Down Hall and Down Hall Lodge".